Description (Goodreads):- War looms in sixteen-year-old Tris’s dark dystopian world as disputes between the factions grow. 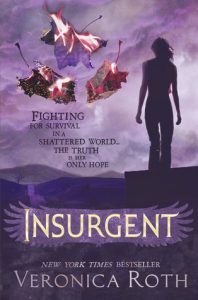 Tris must now fight against all odds to discover the truth that can save her and the people she loves. Sides must be chosen, secrets will emerge – and the choices she makes will have devastating and unexpected consequences. Review:- This was one of the most anticipated books of the year and I know why. I LOVED Divergent as you can read from my review. I was late to the Divergent series party, but on the plus side I only had to wait a few months to get my hand on the sequel and boy was that a long few months. I don’t know if I can wait a whole year for the third book in the series. There are some spoilers in this review if you haven’t read Divergent so be warned. Tris and Four learn a lot about each other through this book, there are a lot of rough patches that they go through and I wasn’t sure they’d survive it. Their character grow and so does their love, but they still have trust issues, they are both stubborn and strong, not always a good combination. There are some sweet and swoon worthy romantic scenes, I would love to see more of these in the next book. Tris matures a lot throughout this book and you forget she’s only a sixteen year old girl. She makes some stupid decisions I feel in this book, but always has her wits about her and always gives herself a fighting chance. I really enjoyed learning more about how the Divergent are different to others in the factions in this book, even into the broken down elements of their brain, it was a really interesting read. I also loved reading more about the factions especially Amity we didn’t hear much about in the Divergent. Divergent is one of my favourite books and was unsure Insurgent could live up to it, but I was wrong, it was as awesome as Divergent was. The ending was brilliant, it came together answering so many questions, but left us hanging with an almighty cliffhanger. I was so tense through out reading this that I didn’t relax until the end. Even then it was all I could think about. What’s going to happen now? This is one of the most action packed books I have read. Something happens on every page, bullets, punches and threats fly from all angles. Nothing in this book is black and white, good or evil, everyone has a reason for what they do whether it is right or not in the eyes of others. I can guarantee you will not be able to put this down, you won’t eat, sleep or shower until you have gotten to the end of this book, it truly is amazing and Veronica Roth has totally blown me away. I have loved being part of the blogger and publisher challenges, I’ve been grouped as part of Team Erudite in the UK and it’s been lots of fun interacting and meeting people on twitter who are also members of my factions. Not forgetting the fun with the other factions. It has been one of my favourite book launches and a lot of fun. Disclaimer:- I was sent the above book as stated in the post from the publisher. I’ve not been paid further for mentioning any of these products in this post. All words and opinions are my own.